Palo verde (Parkinsonia spp.) trees thrive in dry, hot desert climates. Most varieties sold at garden centers are hybrids of Mexican palo verde (Parkinsonia florida), and blue palo verde (Parkinsonia aculeata). Some varieties are invasive in some regions, but the "Desert Museum" cultivar (Parkinsonia aculeata "Desert Museum"), which grows in U.S. Department of Agriculture plant hardiness zones 9 through 11, is seedless and thornless. Plant in mid- to late summer so the trees have time to establish before winter. 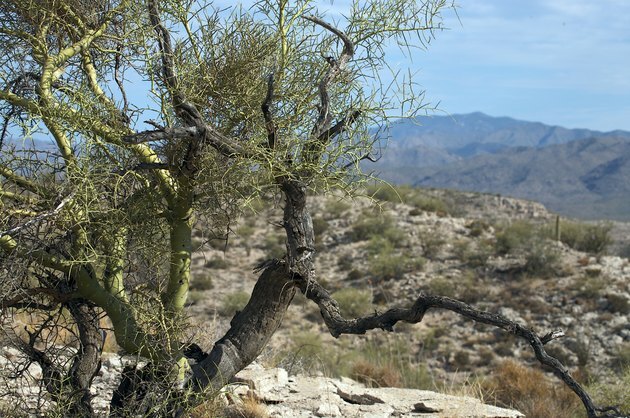 A palo verde tree thriving in the foothills of a desert mountain range. A palo verde tree needs a site that gets full, all-day sun and provides the tree with enough room to grow to its full size. The tree is extremely drought-tolerant but it doesn't tolerate soggy or wet soil, so choose a planting site with well-drained, slightly sandy soil. A mature palo verde can reach up to 25 feet tall and develop a 20-foot spread. Positioning it at least 20 feet away from buildings and other large trees prevents overcrowding. The feathery foliage can shade out grass or other sun-loving plants beneath, but it will perform well near a patio or other area where you'd like dappled shade. You don't have to amend the soil before planting, but breaking it up and tilling deeply does make it easier for the palo verde roots to spread and penetrate deeply. Amendments, such as peat or compost, aren't necessary or desirable because they can alter the soil structure, which can cause water retention problems. The roots may also stay within the richer soil area, failing to establish well. Dig out the soil to a depth at least twice that of the root ball and three times as wide. The larger the area tilled and broken up, the more space will be available for the tree to root. Palo verde trees depend on a deep root system to survive through droughts. The size of the root ball or nursery pot provides the guideline for planting depth. Dig the planting hole to the depth of the root ball, but make it twice as wide. Place the removed soil on a tarp or in a wheelbarrow. Keeping the sides of the planting hole angled toward the center further encourages the roots to spread. Most palo verde branches are covered in thorns, so wear long sleeves and sturdy gloves for handling and planting the tree. For burlap-wrapped roots, set the tree in the hole and untie the burlap from the trunk. Spread out the burlap over the interior of the hole to decompose, or slide it out from under the roots. For a potted tree, set it in the hole immediately after removing it from the pot. Break up the soil around the roots and loosen the root ball slightly. Fill the hole in halfway, and then water to settle the soil before you finish filling the hole with the removed soil. Water a second time after the hole is filled to finish settling the soil around the roots. You don't need to create a raised soil watering ring around the palo verde after planting, because this would only trap more moisture than the tree needs to establish. Palo verde trees are extremely drought-tolerant and they don't need any additional water after they are planted. Watering plants near the Mexican palo verde, which grows in USDA zones 9 through 11, can lead to faster, fuller growth, but the blue palo verde varieties, which grow in USDA zones 8 through 11, can't tolerate the extra water. Palo verdes also do not need fertilizer, either after planting or once established. You can trim out any water spouts, branches that grow straight up at a right angle from a lateral branch. Prune out any lower limbs if you want to raise the canopy. Prune in spring, beginning in the year after planting. Spray the blades of pruning tools with household disinfectant before and after use to prevent the spread of disease.